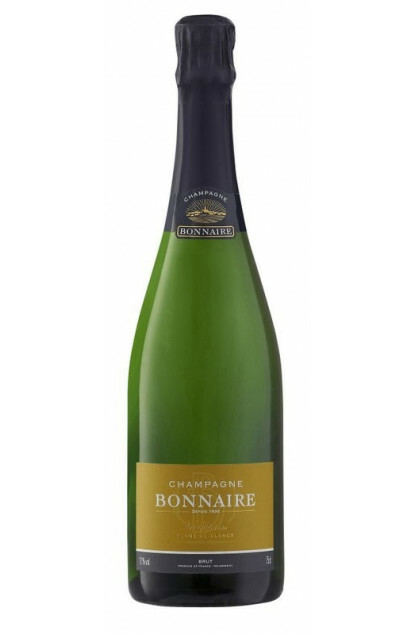 This Champagne is prepared from a single variety, 100% Chardonnay Blanc de Blancs, a blend of wines coming from the Cramant Grand Cru and the Bergères-Les-Vertus Premier Cru. It is the Ver Sacrum quality from the Bonnaire House, whose translation “Sacred Spring” hints at the explosion of perfumes from this time of the year in this flowery country that is full of spring fragrances from the season’s soil and undergrowth. It is the time of Renaissance after the great winter colds. The wine is then bottled to lay on laths and under cork for at least 6 years. The nose is fine and with numerous summery and springy aromas like white flowers and citruses. The taste is full of spring and summer fruits like apricot, cherry, all kinds of strawberries and white raspberries. To be served around 12°C during any festive meal since it fits with almost every food.